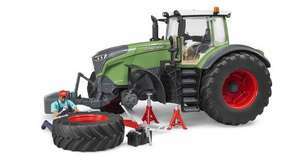 The new Fendt 1050 Vario is Fendts top-of-the-range product model. 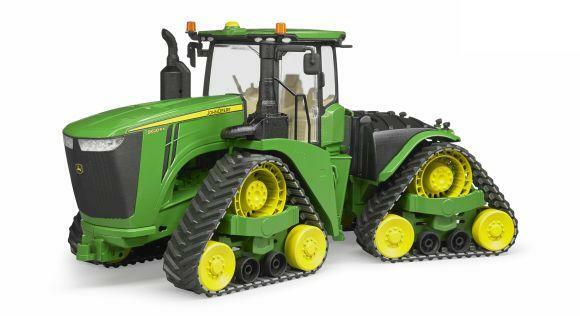 This tractor really owns up to attributes, such as big, strong and unique! Its design, handling and traction force are unique. This is the first model of the new 4000 series. It represents a new reference point with an outstanding attention to detail, is easy to play with and comes with the typical Bruder characteristics, high levels of toughness and quality. The model also features established characteristics, such as the steered front axle or the height-adjustable rear coupling to attach any Professional series trailer. However, there are also some new functions, such as the re-designed front mount to attach accessories and the special highlight, re-developed axles with detachable wheels. This product comes complete with mechanic figure including tools and jack. Wheel changes and any other repairs can be recreated with ease.